Vembu recently announced that they are extending the Essentials package limit to further help out small and medium businesses. 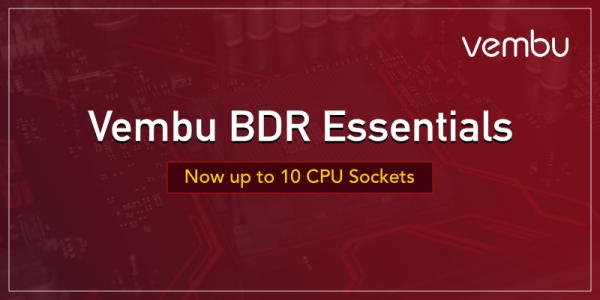 Previously, businesses having 6 CPU sockets (50 VMs or less) could make use of the Vembu Essentials package in order to cut down on their backup costs -- but now, that limit is being extended to 10 CPU sockets (100 VMs or less). That's a significant update! The essence of the Essentials package is to help small businesses to cut down on their data protection expenses. With the extended Essentials package, even mid-sized businesses can avail themselves of the benefits at the same cost, without compromising on features. Vembu BDR Essentials is available at the host and VM level, and at the same time, users can also opt for either the Standard or Enterprise edition based on their requirements. Both editions offer a defined set of features which meets the backup requirements of a virtualized environment. And if your business grows and your requirements exceed the 10 CPU socket limitation, you can move up to the Vemby BDR Suite which covers all the backup requirements of a much larger sized business. The Essentials package is designed specifically for virtual environments; however, with Vembu BDR Suite, you can protect machines running on any environment, be it physical, virtual or the Cloud.